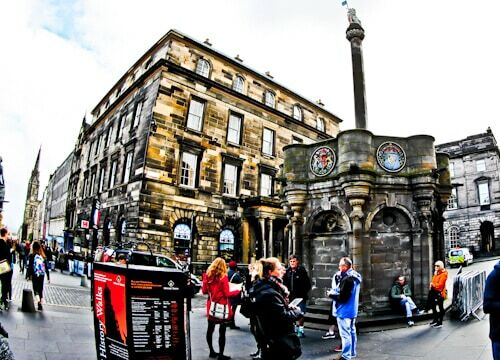 For the Edinburgh Historic Underground tour you meet your guide at the Mercat Cross. Your guide will introduce himself / herself and explain a little about the tour before heading underground. The tour starts from the Mercat Cross on the royal mile which is really easy to find. There is a Mercat tours information kiosk located in front of the cross which you should check out for other tours as well. I went on the 2 pm Historic Underground tour. When I arrived 10 minutes early the Mercat staff were there and ready to organize the group and introduce the guide. If you haven’t bought a ticket, you can turn up 10 minutes before your tour leaves and buy a ticket. 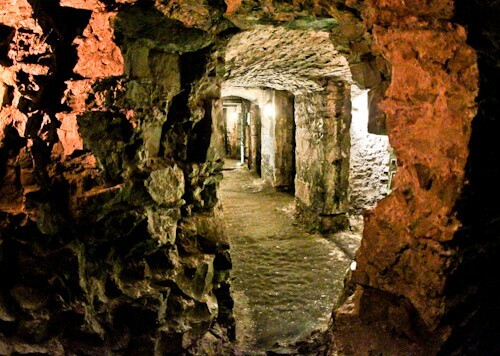 What are the Edinburgh Underground Vaults? In the late 18th century, vaults were built under the Edinburgh south bridge and sold as working space. The vaults were used to house businesses, cobblers and other tradesmen. It was also used as storage space for illegal materials. The infamous serial killers Burke and Hare killed people in Edinburgh and carried out medical experiments on their bodies in these vaults. If you look for the South Bridge today it’s still possible to see parts of it, ask the guide for details. After around 30 years of use by businesses, the vaults were abandoned. They were abandoned due to severe damp conditions and very poor air quality. When the businesses left, the poorest of the poor moved in. As you go through the various vaults the guide will explain exactly what went on in each one. He will explain the terrible conditions people lived in and where the dead bodies were. When I visited they were not so damp and the air quality was good! Things have changed in 200 years. 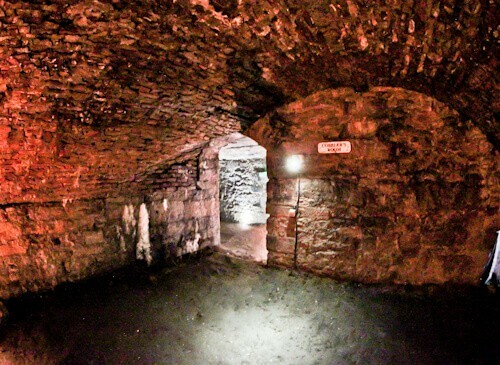 Are Edinburgh Underground Vaults Haunted? A couple of strange things happened when I was in this underground vault. I was taking a photo and another tourist walked in front of me. The lady said sorry and moved out of the way. When I revised the photo there was no tourist in it. Was that someone on the tour or a ghost I spoke to? The other strange event that happened was when I was viewing the room through my cell phone I could see an orb moving. 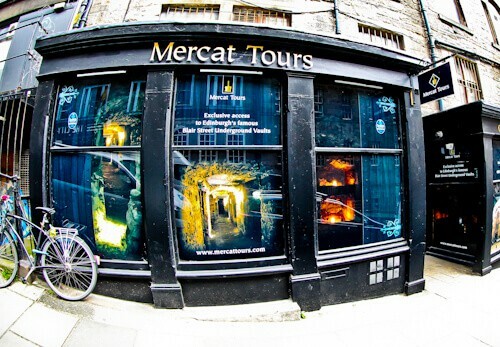 Mercat also do ghost tours which must be scary if strange things happen on a normal tour. The last room you will visit on the tour is the discovery room. This room features artifacts that were found whilst excavating the vaults. You are free to explore this room and pick up a few of the artifacts in there. On the floor there is a huge kettle which will be the heaviest kettle you ever pick up. If you haven’t got enough information on the underground vaults then you can do a little extra reading in here. 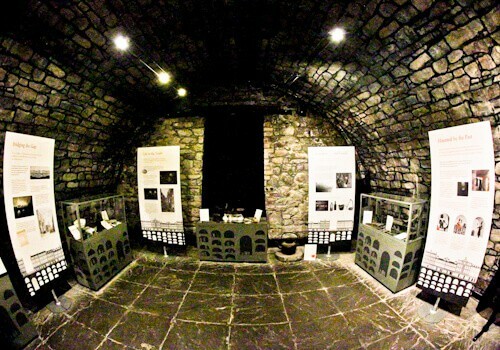 The tour ends at the Mercat Tours ticket office on Blair Street which is also the entrance to the underground vaults. This is a short walk from the Royal Mile where you started the tour. Enjoy your Historic Underground Tour with Mercat Tours. Did you know the deepest underground city is in Cappadocia, Turkey? 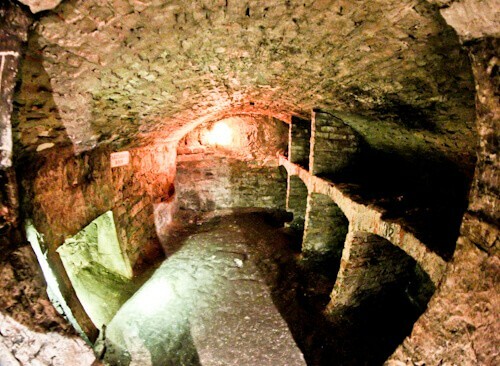 Sofia, Bulgaria also has a historic underground. Well you learn something new every day- or lots of things in this case! There’s an underground city?! The poor lived in it?! There were serial killers who did macabre experiments?? I’ve heard about Edinburgh’s beauty and architecture but never seen this side of it before. It looks like an awesome way to see another side of the city! Have you seen a similar underground city in Cappadocia? No, but I’m visiting Cappadocia this winter so I’ll check out the underground city there! OMG – I had no idea anything remotely like this existed! What an amazing history for people to visit and appreciate. I can only imagine the conditions that existed back then – especially during the time businesses moved out and the poor moved in. Plus – how freaky was your experience with the lady (possible ghost) and orb that you saw? I bet from all the places you have been around the world, you will not likely forget that in a hurry! This sounds so creepy! We have an underground area of Seattle that used to give me the willies as a kid, but it didn’t have dead bodies! I think I’d be too freaked out to tour, so I’m glad I can just read about it on your blog! That bit on a moving orb and the ghost lady freaked me out. At places like these you never know. It’s amazing that they have built and entire city underground and even conducted tests on dead bodies. Incredible and interesting. This totally sounds so so so cool! I am not sure I would have wanted to have a business down there – especially with it maybe being haunted! Eek! And omg the story about the killer doing medical experiments… totally haunted! But what a cool experience it would be to visit here and learn more about the history of Edinburgh. I am not surprised that after 30 years they had to close it down. I have heard so much about Edinburgh and how amazing landscapes the place has. Not really fan of going to haunted places it gives me chills lol. The underground vaults look so scary. James I just got a shiver from reading this! Were you a bit freaked out, or manned up and moved on?! I think I remember hearing about this tour the last time I was in Edinburgh, but didn’t do it. Those vaults looks so interesting, I can’t believe people actually lived there, thank God times have changed! I manned up and caught the group up! I love exploring tunnels so I wish I’d known about this when I visited Edinburgh all those years ago. What an interesting tour! They did medical experiments on dead bodies here??!??!?!?!?! Oh my goshhhhh… I don’t know if I’d be brave enough to visit! Props to you for doing the tour, I think I’d be too scared! I always find it’s excited to discover the underground. Although it’s scary that they did experience at this place 😮 , I still wanna see it. It’s surely an interesting place to discover! Wow thanks for sharing a unique history of Edinburgh. As a self directed tourist, I can see the value added experience verses the tourist self directed guides. Since they have exclusive access I would probably be more challenging if not difficult to tour on ones own which is similar to my experience Bill Speidel’s Underground Tour for Seattle, Washington where Seattle was built over the previous city when it was destroyed by fire in the 1800’s the guides knew a detailed history. I am not intrigued by the hauntings but it does give it a twist as I visited Roman catacombs and felt the hair raise on the back of my neck. I would probably find the same experience, but with a rich history nonetheless. Whoa! We love natural caves, but we never thought that there is an interesting historical and cultural attraction right under the street! The vaults look like catacombs straight out of an Indiana Jones movie. We would definitely love to visit here. A city beneath the ground always promises to be an exciting affair. 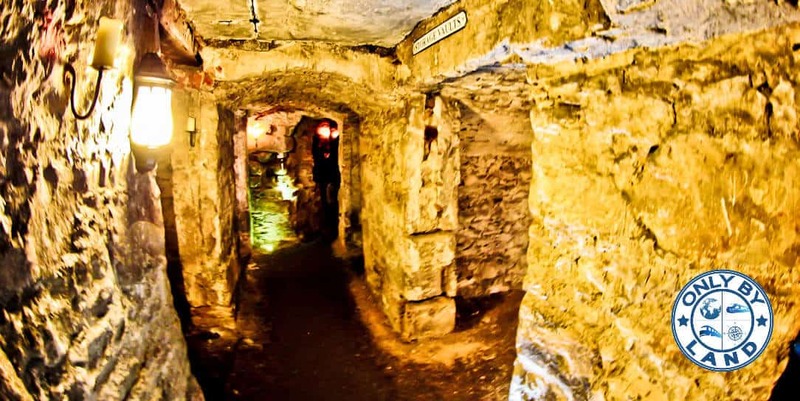 I never knew that there existed an underground city beneath Edinurgh. Would love to take this tour. Sounds so mysterious and exciting. I am sure the dimly lit underground pathways hold many an untold story, waiting to be discovered. An underground tour sounds very unique and thrilling. And there’s a whole city there! What an exciting tour it must be. Thanks for sharing. When I happen to be in Edinburgh, I am not going to miss this one. Funnily, a friend recently told me about this was the reason she wanted to visit Edinburgh. I’m not sure if she’ll like the haunted part but I guess that comes with being an underground city! ???? Edinburgh seems like a worth visiting place and it has to offer a wide range of things. These tours seem so awesome, James. When’s the best time of the year to explore it? I love love love underground tours, anywhere they have it available! You’ll have to do the Seattle Underground Tours someday (or have you done it already?) as it’s said to be one of the best underground tours. Thanks for joining Fly Away Friday – hope to see you again this week! xo P.S Lovely to see you on the linkup outside of Instagram!